We are affiliated with The Christian Church (Disciples of Christ). This restoration movement for the New Testament Church. began during the Great Awakening on the American frontier during the early 19th Century. In an attempt restore the vital spirit of the New Testament Church, we emphasize the universal name "Christian" while remaining a distinctive fellowship "Disciples of Christ" within the whole Church. Following the first Christians, we celebrate the Lord's Supper on the first day of each week, we recognize the priesthood of all believers, and we baptise believers by immersion upon a profession of faith. We also accept other forms of baptism in receiving new members by transfer. 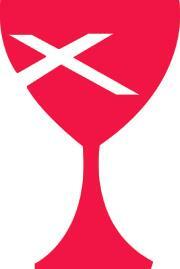 The red chalice with the white cross is our denomination's emblem. The chalice denotes our weekly celebration of the Lord's Supper. The St. Andrew's Cross represents our Scottish-Presbyterian background. We stand on the inspiration and authority of the Bible, seek, through prayer, the revelation of our stillspeaking God, and are empowered by the Holy Spirit. Why choose Guyton Christian Church? We are Bible-based, have spiritual passion and believe in the power of prayer! The dedication, leadership and involvement of members is evident in the love and fellowship we share with one another. Our church has a strong historical connection with our town and our county. We enjoy mission and community outreach activities. We are not afraid to have fun!